A big shock awaited Iain ‘Maxi’ Grubb at Scrutineering for the Coltel Granite City Rally. He thought he was going servicing for young Darren Jones in the BMW, but when the car turned up and drove into the Scroot’s tent, Maxi’s name was on the windows and plastered all over the car with the additional message ‘Happy 40th Birthday’. 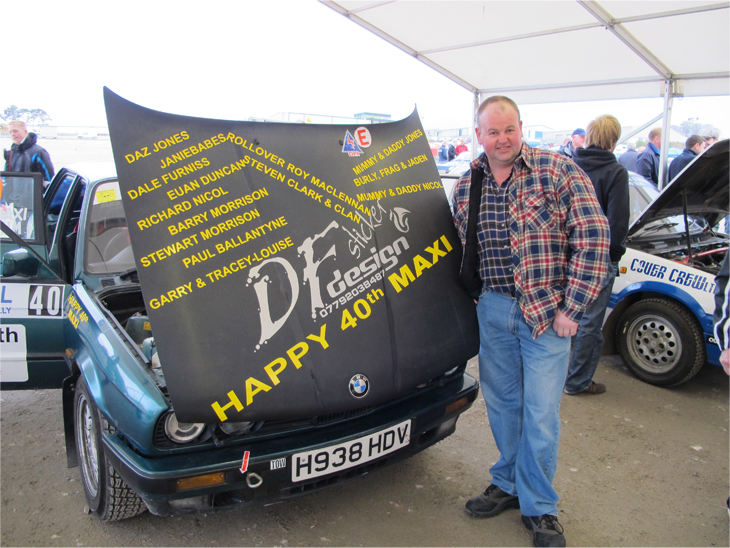 Completely unknown to him, Jane Nicol had arranged this special surprise for one of club rallying's nice guys. Always willing to help anyone out, Maxi’s pals had ganged up on him to arrange this special surprise. Iain started rallying in 1999 in a Talbot Sunbeam, then a wee Peugeot and finally a Lancer Evo 5 but stopped competing regularly in 2006. Apart from one outing in 2008, he hasn’t sat himself in the driving seat since – till now! Fortunately he had kept renewing his competition licence so all the gang had to do was get his helmet, suit and him to the rally while Darren brought the car. Simple, but effective. As for Maxi? Gubsmacked? Never was a man's gub so well and truly smackered. But what a lovely gesture by his friends. Nice one guys - and guyesses!